Author’s note: some readers may find it silly that I use Magic: The Gathering to help me define my own philosophy of life. It’s the most convenient mythos for me to appropriate, having played the game for a number of years, and being a bigger fan of the art and flavor of the game than actually playing it. In this post and future posts I will make reference to Magic characters, stories, colors, and philosophies, introducing them where appropriate, and explaining how they help me understand intangible concepts like “wildness” and “abandon”, today’s subjects. Elspeth Tirel, a knight of Bant, chosen by the sun god Heliod of Theros, killed a god. As you can see in the art above, she sliced off the hand of Xenagos, God of Revels, and stabbed him in the heart, bringing him to death. For Elspeth to kill a god, she had to build the strength to kill something no longer mortal. She faced many challenges and and came near death several times. Elspeth’s story is fascinating, and I won’t do it justice by summary here. I’m looking to the Elspeth as inspiration for facing some of my monumental fears. Her defeat of Xenagos ties well with my facing a fear of abandon, of losing control and not accounting for consequences. Xenagos can represent my fear of abandon, because his colors represent the concepts of wildness and abandon. He is a god of red and green magic, where red is the color of passion, and green is the color of ferocity. Combine red and green, and the result is wildness in the positive aspect, and abandon in the negative aspect. After her defeat of Xenagos, Elspeth said, “It is done.” I can say the same thing about completing the 100 Write-Off haiku. I raised the money I needed to fundraiser by writing 49 haiku, and when the fundraiser ended, I didn’t see a reason to keep writing, even though I pledged to write 100 haiku. I made a promise, and I didn’t want to hold to a promise just for the sake of holding a promise. I didn’t hold to my commitment. Instead, I ignored the haiku project, and I pursued whatever I was passionate about at the time. I was full of abandon, the red and green monster, the dark side of wildness. 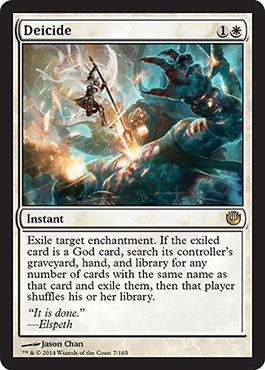 Commitment is a characterstic of white magic in M:TG, and Elspeth specializes in white magic. Her hard work and dedication allowed her to defeat a god. My commitment, my use of “white magic”, allowed me to defeat the red and green beast within me and complete what I said I would do. I should note that other activities will help me cultivate the good side of red and green, being free and wild and passionate. I will write about those another time. For now, white had to beat out red and green to complete the Write-Off Haiku project. 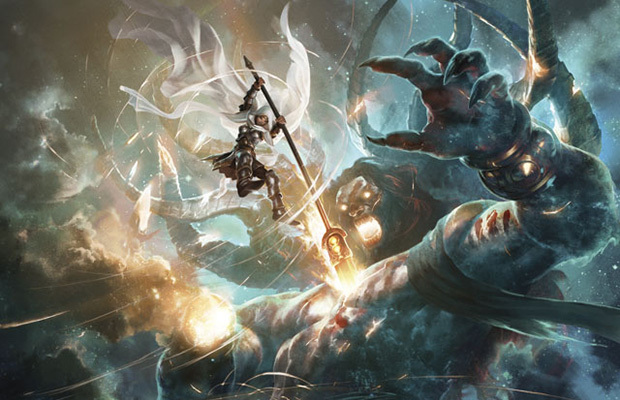 Below is the Magic card with the art of Elspeth defeating Xenagos, called Deicide. Appropriately, a white Magic card represents white magic.